Regardless of where this finds you today, could you use a little extra strength to get you through everything you are going through? If you could use a word of encouragement, read on! Notice a few things that God told His people through the prophet Zechariah. First, they would find themselves in the sea of trouble. The people of God were never promised calm seas . . . only safe passage. “They will pass through the sea of trouble,” the Lord said. This means that whatever you are currently going through, you are going through it. You will be brought out on the other side by God’s mighty right hand. Next, God promises to strengthen His people as they are passing through the sea of trouble. So instead of getting weaker along the way, as we would expect in the economy of this world, God promises that we will go from strength to strength (Psalm 84:7). “How is that possible?” you may be thinking. It is because we go—not in our name—but in His name, and there is power in the name of our God! Finally, notice that the strength our Lord gives us causes us to walk, which suggests forward progress. It’s true that it is possible for us to walk backwards, and at times we do just that in our proverbial “one step forward and two steps back” mode of growth in the Lord. But here God is assuring us through Zechariah that He will give us the strength to go through everything He is calling us to go through. 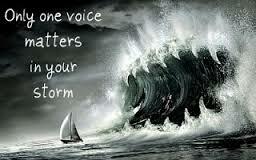 So regardless of the “surging sea” you may be facing today, it will be subdued in the name of your Savior. There is a special word of comfort when God says “the depths of the Nile will dry up.” Imagine what power and might would be required to make that happen! Just like the children of Israel who walked along on dry ground, with surging walls of water on both sides as God parted the Red Sea, God will dry up any “surging sea” you may be facing today. Call on His name today; He is ready to do the same for you right now!